After about a week of polling on views of shirtgate (also known as shirtstorm), the results are in and there are some pretty clear findings. The poll sought to measure people’s views of Dr. Matt Taylor’s wearing of a shirt covered in depictions of scantily clad woman including some with guns during a TV interview on the Rosetta comet landing project. The two most polar possible choices got by far the most answers indicating intense feelings on this topic. By almost a 2:1 margin (52% versus 27%), the more than 2,500 respondents indicated that they viewed the wearing of the shirt as a non-event that was blown out of proportion. There were responses from 69 countries to the poll and in almost every country of the world the view that the wearing of the shirt was a non-event blown out of proportion won out. However, the reponses did vary relatively speaking in some interesting ways between countries. In Taylor’s home of the UK, responses were relatively one-sided. In the UK, 63% of responses were that the wearing of the shirt was a non-event and the reaction to it was the problem, while 4-fold fewer (15.6%) viewed the actual wearing of the shirt as a problem. About 2% said either “scientists should wear whatever they want” or that it was a mistake for Taylor to have worn the shirt. In the US, the numbers were relatively far closer together. While 43% said the wearing of the shirt was a non-event and the reaction to it was the problem, 35% viewed the wearing of the shirt as problematic. 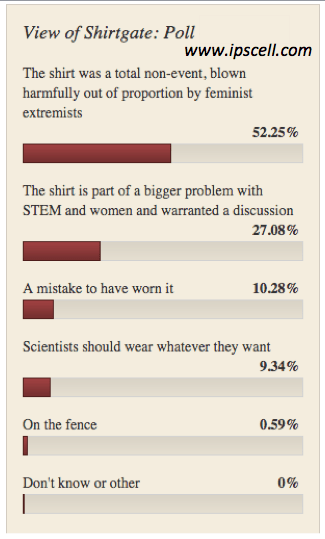 In addition, in the US 13% felt “it was a mistake to have worn it”, while 7.5% said “scientists should wear whatever they want”. Therefore, if you add up the total of the two responses viewing the wearing of the shirt as a problem or mistake, and those two opposite responses viewing the wearing of the shirt as not a big deal, they were roughly equal, but clearly more people felt more intensely that there was an overreaction to the wearing of the shirt. Still these numbers are far closer together than in the UK and in most other countries of the world. Luxembourg (2 responses that way and no others). These countries had relatively few total respondents though so it is difficult to say whether these trends would have held up with larger numbers of answers from those countries. Some countries were relatively one-sided the other way viewing the reaction to the wearing as more of a problem than the actual wearing of the shirt by the indicated ratios: France (>7:1), Canada (~2.5:1), Australia (2:1), Germany (>3.0:1), Greece (6:1), Netherlands (2:1). What are your thoughts on these poll results? Note that this poll is an Internet poll so the trends can be skewed by various factors and potential biases including how the poll was disseminated on social media. The poll could have been designed in different ways as well that may have yielded distinct results. Erdogan is also trying to restrict access to birth control and one of his Ministers has declared that women should not laugh in public! Historians might also ponder that Erdogan claims that Muslims discovered North America (not Christopher Columbus). Bloggers might contemplate that Erdogan blocked websites (Twitter and YouTube). Erdogan’s political party (AKP) has mounted underhanded attacks upon the Theory of Evolution. That’s an attack on the very foundation of biological science. Surely that should be of concern to every scientist? I say, “Forget little fish. Fry the big fry”. Paul- what bothered me about the poll is that you used the term “feminist extremists”. I haven’t met a female scientist who hasn’t been overlooked, discouraged, and casually dismissed by male colleagues – it still happens to me. I would therefore be one of your extremists, who is waiting for those who believe we are inferior to become extinct. I’m sure that you meant to be using the term lightly or ironically, but there really is no need to joke about this. Yeah, in hindsight I think that was perhaps a mistake and the phrase “feminist extremist” should have been left off, but that was meant to reflect how extreme some were reacting on one side. Wow, that’s really disappointing. As a woman, and a former scientist, I found the shirt (worn in that context) very offensive. I’m sad to see that most of your respondents (who are themselves likely to be involved in the biological sciences) disagree. To me the fact that the majority of those working in my former field didn’t have a problem with the shirt indicates that there’s a lot of work to be done to change the current research culture to encourage and support women and minorities. I’m also curious about whether the responses to your poll would have differed if the shirt had instead represented a different group of people in a disrespectful way. Perpetuated stereotypes about minorities? Insulted those with different political views? Why is it then that we still give a free pass to men who actively objectify women in the workplace? There’s a lot more to be said, of course. But the results of your poll are pretty disheartening to me. You were very offended by a SHIRT depicting characters from comics? Probably you are the same person that goes in the street asking for freedom of women to wear whatever they like (and rightly so). The video of Taylor apologising for a SHIRT, at the moment of his highest success was one of the saddest thing I’ve seen recently. The fact that this guy accomplished something absolutely amazing from a scientific point of view, and that he had to apologise on live TV because some self-righteous people found some comic books characters on a shirt VERY OFFENSIVE, would have been a total joke if it wasn’t this depressing. To say with Boris Johnson “It was like a scene from Mao’s cultural revolution when weeping intellectuals were forced to confess their crimes against the people.”. Get real. There are so many issue about gender equality in the US like elsewhere, in research and outside of it, that I find absolutely baffling that some women decide to degrade the importance of the feminist movement focusing on things like this. B) the feminist movement loses credibility in the eyes of everyone with a grain of rationality, causing a damage for legitimate campaigns. >> Why is it then that we still give a free pass to men who actively objectify women in the workplace? > The video of Taylor apologising … was one of the saddest thing I’ve seen recently. > [T]hat he had to apologise … would have been a total joke if it wasn’t this depressing. These are not answers, they are attempts at not taking the issue seriously. People aren’t upset about the color or cut of his shirt, but rather its portrayal of objectified and sexualized women. That is “really” something to “get real” about and to apologize for. Dr. Taylor did that once he realized his mistake. His scientific accomplishments are a moot point in this discussion; an accomplished person is perfectly capable of doing offensive things, and ought to be held accountable, especially if their offence makes international news. The idea that that shirt, plesae have a look at it if you haven’t done it properly, could be considered “very offensive” and that it “objectifies women” and in generally that should be something to be ashamed of, is plain ridiculous and tells me that some women (and men) have completely lost the sense of the feminist movement, something we would actually need as strong as ever focussing on real issues. Dr. Taylor was forced to apologise after being abused by extremists with probably too much time on their hands. I am actually glad to see that the majority of people answering the poll from all over the world see it that way, it means there is actually hope that society does not turn into a constant outraged mass of tweeting abusers. Why are women in science payed less than their male counterparts? Why do so many women leave science after initial stages of early career? Why are women generally funded less than men? What can we do to avoid that women would have to choose between family and career? These are real problems in gender equality that should cause rage and strong reactions, that is just an ugly shirt with some characters from comic books. Unlike previous polls on this blog I am not sure that most of the respondents are involved (or interested in) in biological science or science in any way, as is kind of implied in the note at the end of the present post. Votes were unrestricted and anonymous, if the link to the poll was posted in any forum/irc chan/whatever online community skewed towards one of the opinions (which is I think more likely in that case than for more “real science”-related polls), one can expect a lot of votes from non scientists. Would have been interesting to see how the polling broke down by gender. Perhaps women see the issue differently than men.